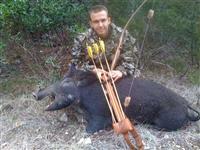 September 2011 Colorado Traditional Archery Elk Hunting Trip with Code of the West Outfitters, LLC out of Meeker, Colorado. This is the best hunt we have been on - saw alot of Elk everyday and Code of the West Outfitters provide exceptional service. 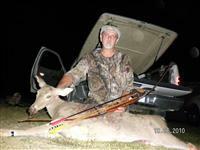 Michael Smith's First Bow Harvest, Bug Scuffle Ranch, LSBA Youth hunt, Preditor Longbow, 10 Again woods, Sasquash broadheads. 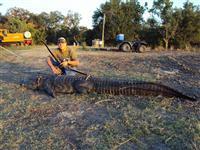 This is an 11' 1" alligator I took on 9/12/11. He weighed 390 pounds. 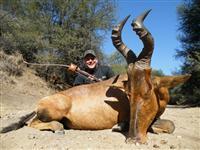 I shot this lizard with a Bob Lee recurve, 52#@29"
Here are the pics of the animals I got in South Africa in July, 2011. Bisch. 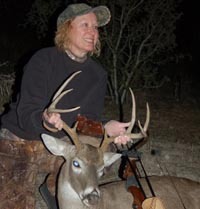 I went out to the lease for the turkey season opener but could not find any cooperative toms. I did, however, locate the pigs! 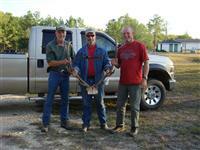 I shot the 165# boar on 3/24 on the evening hunt. 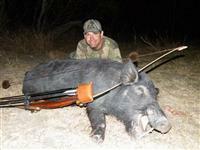 Then on the 3/25 evening hunt a bunch more pigs came in and I took a nice 82# eater sow. 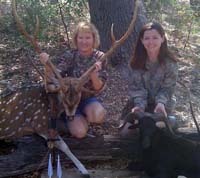 Both were taken with my bab Sarrels Blueridge takedown longbow (50#@29.5"), GoldTip 55/75 arrows, and 150gr German Kinetic SilverFlame XL broadheads.